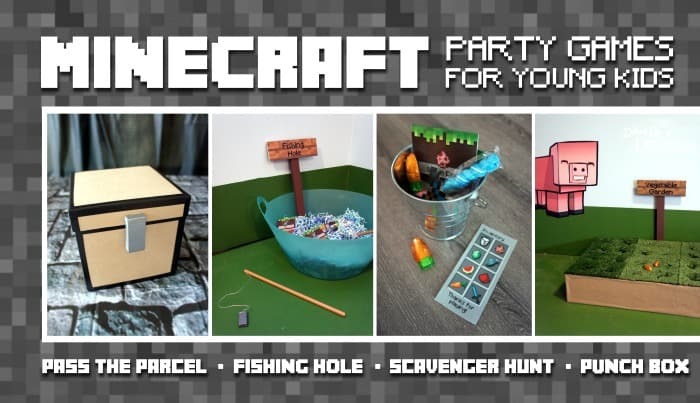 These Minecraft Party Games are courtesy of our contributor Chantelle of Dolled Up Design…For my son’s 6th birthday party, I knew a lot of the kids wouldn’t be familiar with the Minecraft theme, but I still wanted to incorporate some of the aspects of the game into the party activities. I had 15 young guests coming to our house and I wanted to come up with something fun that they would all be able to participate in and enjoy. A huge component of Minecraft is the hunting and gathering food and materials, so my thoughts immediately went to planning some kind of treasure/scavenger hunt. 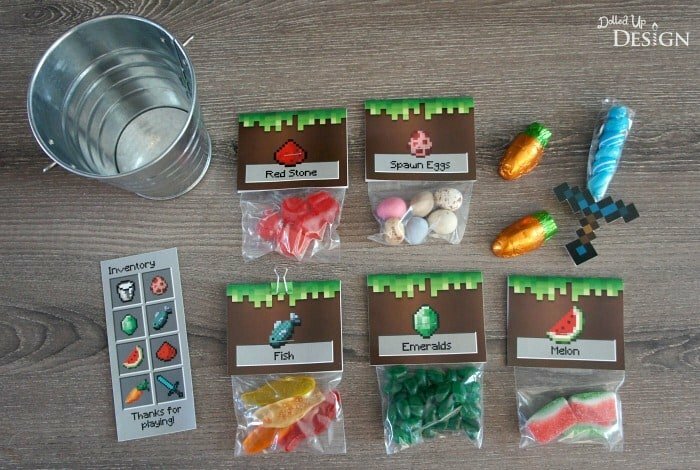 There is a myriad of great Minecraft themed candy ideas out there, so I decided to use some of those and have the kids collect small bags of candy items throughout the party as part of their final party favor to bring home. 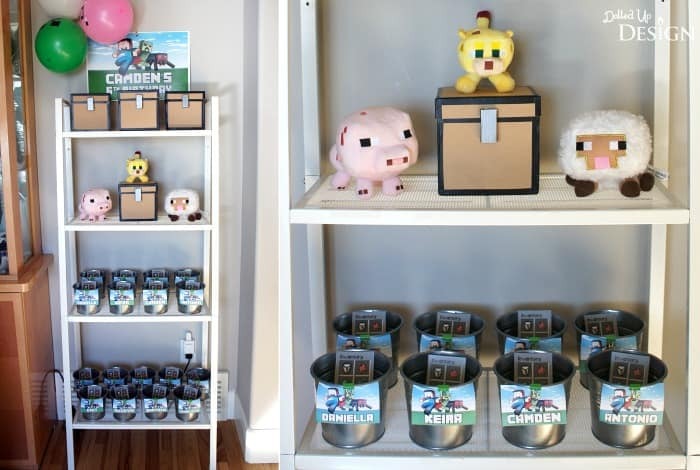 Each party guest was given a small metal pail and an inventory list to complete. Our guests ranged in age from 3 to 7 so I designed a visual list they could all easily follow, that mimicked the style of the item inventory from the game. For the candy, I bought in bulk and repackaged them in small zip top bags with paper labels I printed and designed myself. The first item the kids collected for their treat pails came from our game of Pass the Parcel. 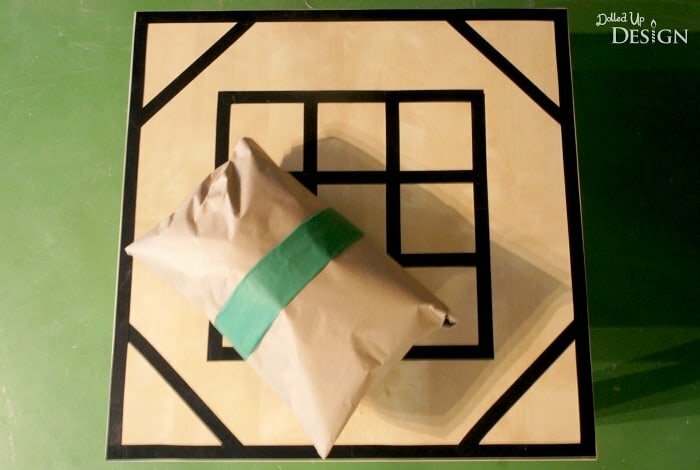 If you aren’t familiar with the game, it is a multi-layered gift which gets passed around the room. Each guest gets to unwrap a layer and if you are lucky enough to open a prize layer, you get to keep that prize. Since the kids were all very young, I decided to have my Pass the Parcel contain a small prize in each layer, as well as two larger bonus prizes. Each child got a small lollipop I transformed into Diamond Swords by gluing on a printed-out handle. The bigger prizes were a Qixel’s sword kit and a Minecraft Hanger. To choose whose turn it was, I decided to have my birthday boy select the gift he wanted to unwrap and the gift giver got to unwrap their layer at the same time. 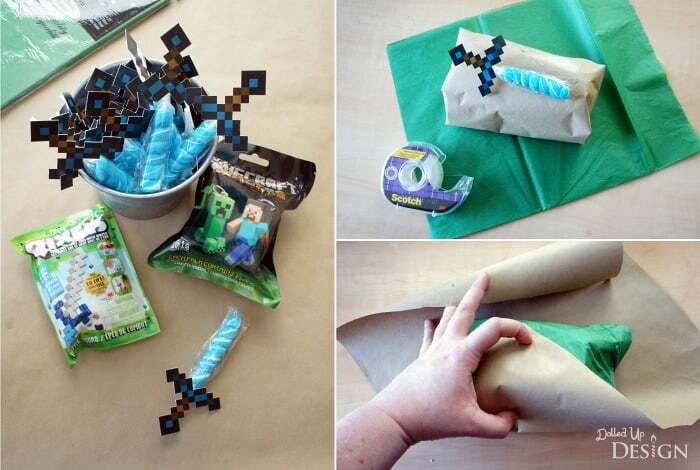 Once the kids each had their Diamond Sword lollipop’s from the Pass the Parcel game, it was time to find their party favor buckets and begin our Minecraft Scavenger Hunt. 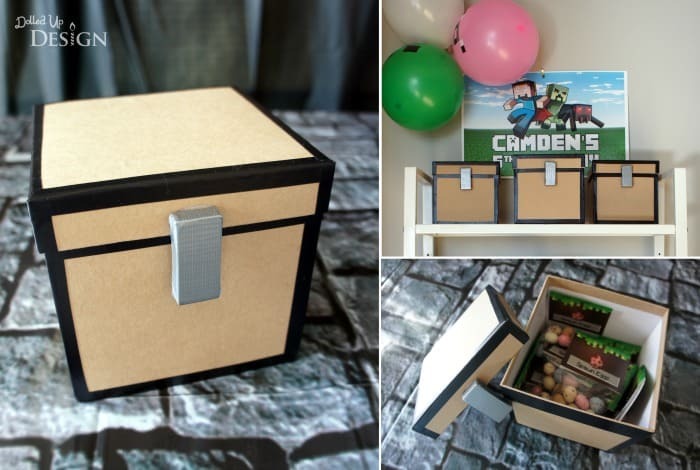 A few of the items were put in these DIY Minecraft chests and hidden throughout the upper level of our house. These were quick and easy to make using some cardboard gift boxes I found at Michael’s, and a bit of electrical tape and duct tape for the details. I had my husband sneak away during the gift opening to hide the 4 boxes. Each contained one of the following: watermelon jelly bean “Emeralds”, red jujube “Red Stone”, mini chocolate egg “spawn eggs” and candy watermelon “melon”. 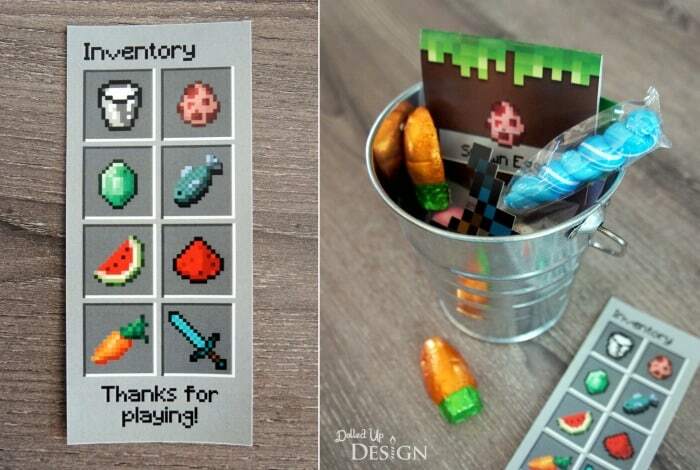 Since fishing is a component of Minecraft, another of the candy items on the Inventory List was gummy fish. 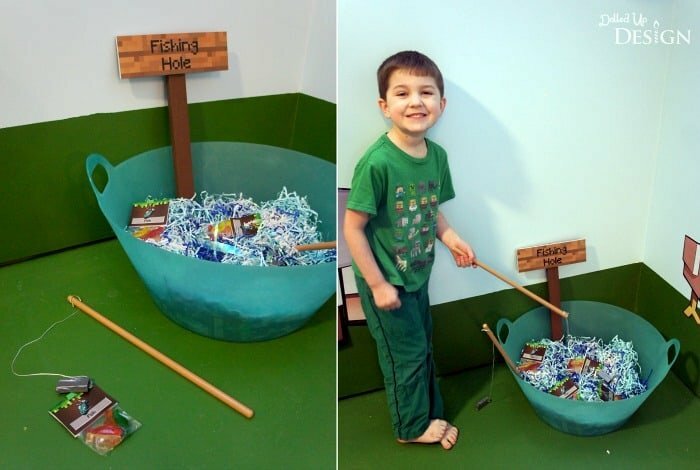 I thought I would have a bit of fun with this item by burying them amongst some tissue filler in a large tub “Fishing Hole” and having the kids actually fish for them. To make my fishing rods, I found some plastic sticks at the dollar store that I was able to thread a string through and taped a strong magnet to the other end. The bags of candy fish each had a bulldog clip attached to them so when the magnet passed over them, it grabbed the metal and the kids were able to pull out their candy fish. 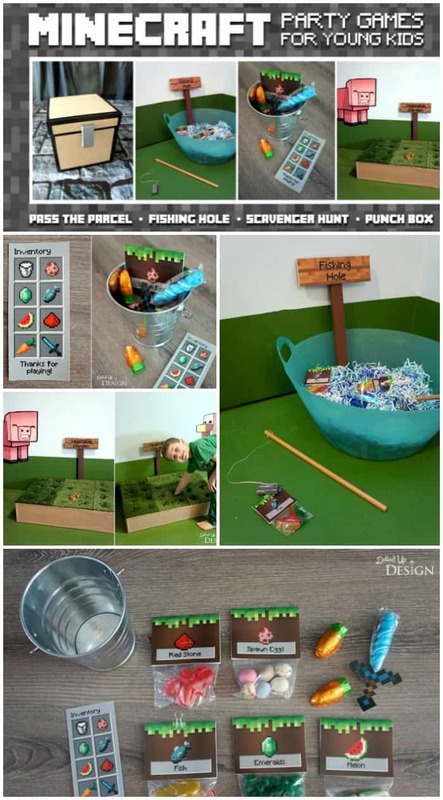 I also wanted to incorporate the gardening aspect of the game, so the final item was hidden in this DIY Vegetable garden punch box I crafted from paper cups, foamcore and fake grass. Both it, and the Fishing Hole, were placed in our basement for the scavenger hunt. Each child got to dig down into the grass and pull out two chocolate carrots to add to their treat pails. 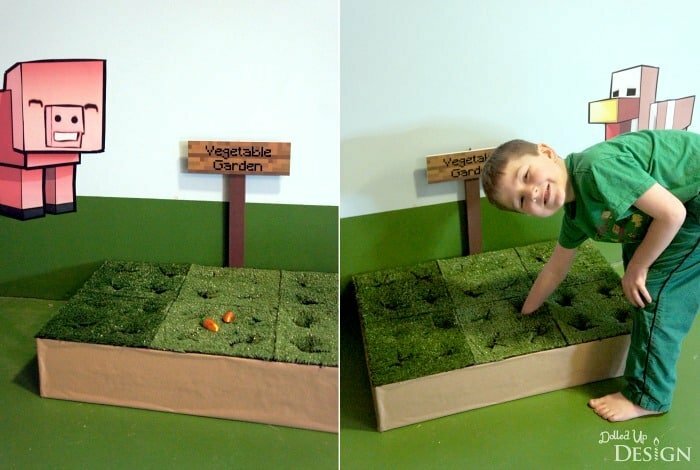 As more carrots got pulled, it got trickier for the other kids to garden for their carrots. The hunt was quite chaotic with that many young kids running through the house, but they all seemed to have a ton of fun finding all the items on their inventory lists. They were all very proud once their lists were complete and couldn’t wait to get into all the little bags of candy. 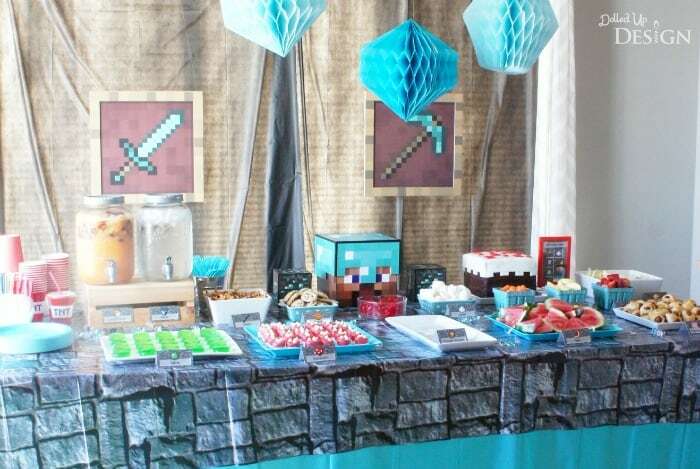 And even though this party was Minecraft themed, a lot of the activities could easily be used and adapted for other party themes. I got quite a few disappointed “aww’s” when it was time for my little guests to go home, so I can assure you that any one of these would to keep the young kids entertained and happy at your next party. 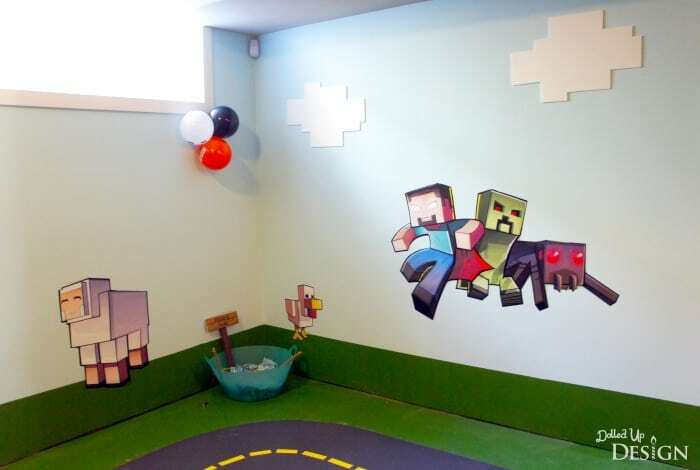 Stop by Chantelle’s blog, Dolled Up Design, to see even more Minecraft Party ideas! 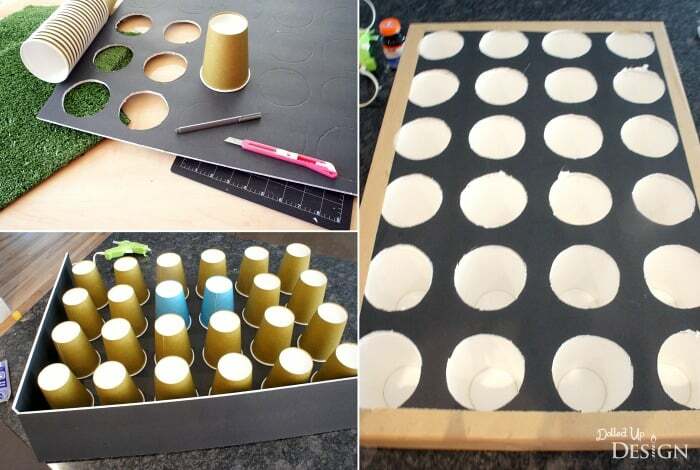 We’d like to send a big THANK YOU to Chantelle for sharing these incredibly creative party games with us. Her parties are always easy to recreate and kids love them! Be sure to follow her on Facebook to stay updated on all her fabulous ideas. We’re always adding new ideas for parties and family fun. Never miss an update by following us on Facebook, Twitter, Pinterest, and sneak peeks on Instagram! Minecraft has become so popular! These games look like a lot of fun! Thanks for sharing at Brag About It! Pinned and tweeted to share. Where can I find these printables?